No, I’m not referencing Harry Potter with this post title… however the book series did just turn 20 years old this week. How crazy is that?!! I don’t know about you, but I always score big time during the NET-A-PORTER End of Season Sale! I used to shop it right away as soon as the sale hit the site, but this season I waited for clearance to see what was left and available at the highest discount possible. Maybe it’s because I’m spending most of my money on furniture and drapery these days, but I’ve really scaled back on big ticket items in my closet. Aside from a few necessities I needed to pick up like the wedding-appropriate accessories in yesterday’s post, I’ve really been trying to opt for under $100 styles lately. 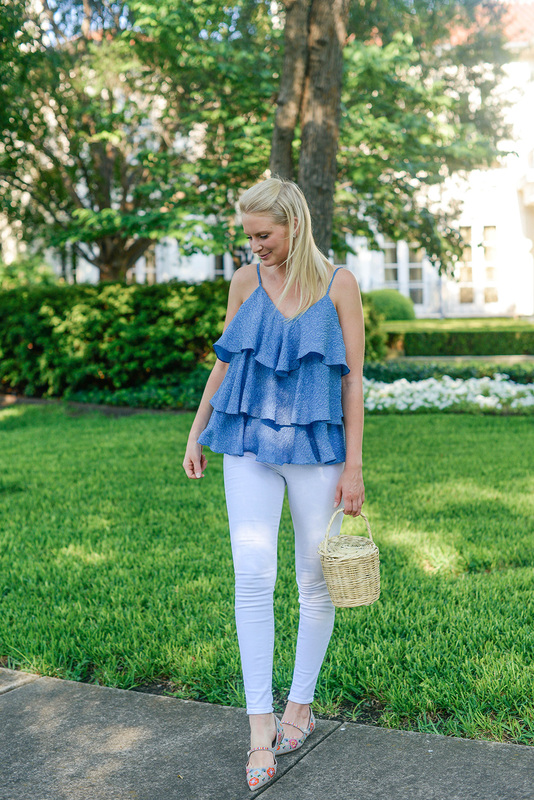 I have lots of beautiful white tops for the summer months, but when I saw this dreamy periwinkle blue top was part of the sale I immediately checked to see if my size was available! It’s always nice to throw in a pop of color over white denim, don’t you think? I love the tiered ruffles on this blouse, and if you look closely you can see the fabric is textured in a floral design. So summer perfect! 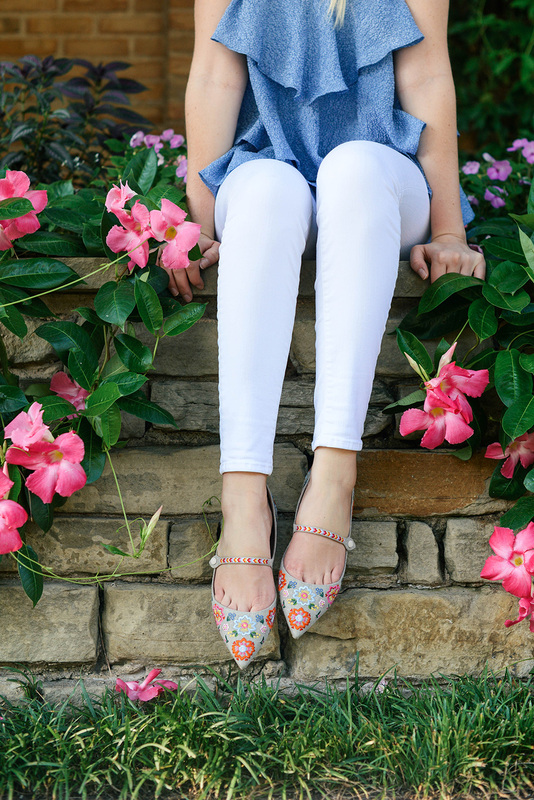 The pretty blue hue matches my eyes, and also happens to look great with another sale find I snagged during the sale: these Tabitha Simmons Hermione flats. While they are no longer available in the color I picked up, you can find them here and here in other colorways. 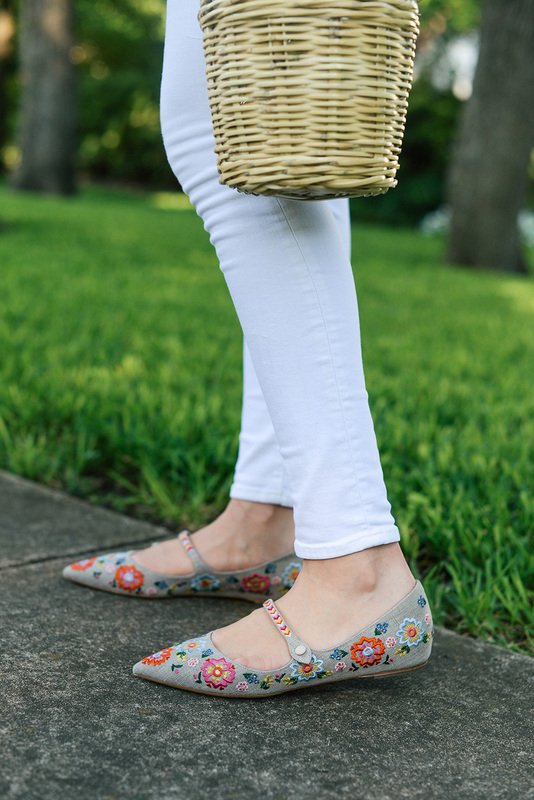 The flat Mary Jane silhouette is so fresh and stylish, and the colorful floral embroidery gives these flats a girly touch. I wore them for the first time last week with a bright yellow Tory Burch shirtdress and received so many compliments! If you prefer the color I’m wearing, try the espadrille style or this sandal that are both still available! This pretty yellow bikini is new to the sale, and would look so glamorous with a tan! The bow detail on this little black dress is amazing! PS – it’s Tibi and marked down to under $150!!! Are you a night runner? Grab a pair of these reflective neon sneakers, now 50% off. This Missoni scarf is now marked down to $65 and would lend the perfect pop of color for any of your summer travel outfits. Also love this one on sale for only $39! Gather inspo in yesterday’s post! I don’t know about you, but I’ve always wanted a pair of laser-cut Alaia heels, and these are fabulous! Normally I wouldn’t spend this much on a towel for the beach/pool, but can they really get any cuter than this or this? Remember these quilted pumps I bought last fall? They’re half off! If you’re a pink lady, you need to check out this pleated Prada dress. I’m shocked it’s marked down as much as it is! This pair of charcoal jeans would be an excellent edgy staple to have on hand this fall. Speaking of staples, this tunic-style blouse would be a great work-to-weekend basic! Love love love the top and flats!! This outfit is so cute!